@Profile June 2018 - A Ray of Sunshine! Welcome to another summer edition of @Profile, summer is finally here and usually we take the time to give you advice on making your summer holidays stress free, but this year we're putting products and services we think you should see in the spotlight! We'll be introducing a long awaited new Pegasus product, celebrating a fantastic team achievement, meeting another member of our team and discovering more about one of our third party products. Read on! The Pegasus Partner Seminar was also the location for this years Pegasus Partner of the Year Awards ceremony! Pegasus partners and resellers from across the country gathered, hopeful to win 'Pegasus Partner of the Year' in their area, as well as overall in the UK. Profile were there represented by some of our Sales Team: Peter, Karen and Patrick (pictured above with Sue Flavell and Stuart Anderson from Pegasus) , who were eager to see how we'd done! 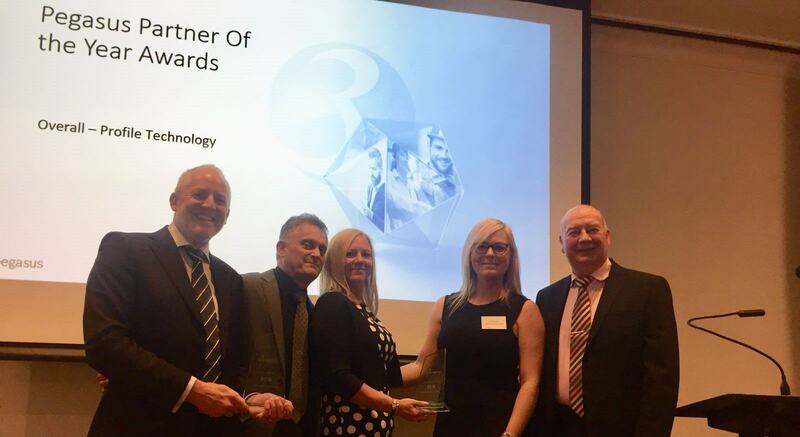 We're happy to announce that not only did we win Pegasus Partner of the Year for the South of the UK, we also won Overall Partner of the Year for the entire UK too! Congratulations to the whole Profile team on all their hard work in ensuring that we are the #1 Pegasus Partner in the UK! We've been updating and teasing you with news about Opera 3 SQL SE for some time now as Profile were a part of the testing phase for the new product, we're happy to announce that it has now been released! We have updated our website with a load of new information about what's included in this new release plus a brochure straight from Pegasus so you can find out even more. Patrick Hatfield is a member of our Account Management team who has been with Profile since March 2015, he specialises in Pegasus solutions as well as business networks and servers. I sat down with him recently to ask him a few questions! What’s your favourite thing about the job? Pat: Helping customers take full advantage of IT / Software, thus resolving business issues and improving upon business process. What did you learn at the recent Pegasus partner seminar? What’s your favourite thing about Opera? Do you have any hints or tips for anyone using a Pegasus solution? Pat: Keep it up to date, don’t fall behind. Pegasus release updated versions of their software for a reason, so take full advantage of your Opera 3 software maintenance program, after all you are paying for it! Pat: I don't like flying so my dream holiday is a cruise! KC eCommerce from Kamarin Computers is an eCommerce solution that allows you to easily link your online shopping cart to your Pegasus Opera 3 system, whether it be on your website or via a third party app. With KC eCommerce Link all of your data is available in real time in Opera 3 and changes made are instantly reflected on your eCommerce platform.